Marto Richard the Lionheart Shields for sale are 34 ¾ inches by 19 inches. These triangular shaped, or kite shaped medieval shields are made to honor Richard the Lionheart and feature his famous three guardian lions passant coat-of-arms. The lions are crafted from a metal sheet and gold plated. These medieval shields are made in Toledo, Spain and crafted of solid heavy gauge steel that has been double reinforced with triple reinforced corners. The edges of the shield have been accented with polished brass and heavy rivets. A metal hanging chain is attached on the back. 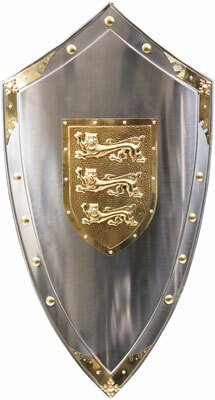 Buy these Marto Richard the Lionheart Shields for $369.99.